Faecal bacteria – bacteria that are present in the digestive system of humans and animals – are known to contaminate waters. They can sometimes be a health hazard. Little research has been conducted into the spread and distribution of faecal bacteria in rivers and, above all, into their input from the surrounding landscape. Researchers from the Leibniz-Institute of Freshwater Ecology and Inland Fisheries (IGB) and from Scotland's University of Aberdeen have developed an indicator-based model that can be used to assess the dynamics of faecal bacteria such as E. coli on the basis of hydrological processes in the landscape and the connectivity of streams – an important basis for managing the acute or sustained microbial contamination of waters. To be able to understand the spread and fate of faecal bacteria in waters, scientists must also record the areas of origin, the quantity, and the flow paths of water in the landscape, and take into account inputs to the river network. 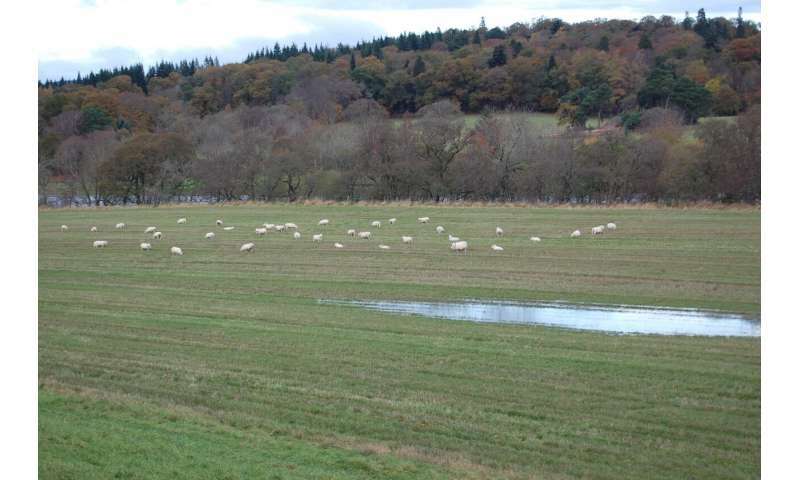 Based on a study area in Scotland, Dörthe Tetzlaff from IGB, her doctoral student Aaron Neill and their colleagues from the University of Aberdeen (Chris Soulsby and Norval Strachan) explored the spread of labelled faecal indicator organisms in a catchment area. They then coupled the data to hydrometric values (quantitative determination of the hydrological regime) and stable isotope tracers. "Combining such data constitutes an innovative approach. Based on our findings, we developed a mathematical model on the spread of faecal bacteria, which can be transferred to other regions as well", explained Chris Soulsby from the University of Aberdeen, the holistic concept of the study. Both the researchers' field trials involving indicator bacteria and their mathematical model demonstrated that the degree of hydrological connectivity plays a crucial role in the distribution of faecal bacteria. Using this method, the team was able to quantify exactly when, and from where, bacteria enter the system. "In our study area, the concentrations of faecal bacteria in streams were highest in summer, which can also be expected in other regions. Summer is the most popular time for recreational use of rivers and intense rainfall events occur more frequently, flushing bacteria from surrounding areas into freshwater ecosystems. In summer, therefore, bacteria that do not originate from the immediate vicinity of the stream also enter the water, whereas in winter, bacteria stored in the riparian zone are mainly mobilised. The model we developed successfully captures the actual distribution of bacteria in summer," stated Dörthe Tetzlaff, outlining the results of the study. The researchers need to adapt the indicator-based model to improve its predictive accuracy for the winter months.. The researchers believe that the reason for this disparity could be the elevated mortality rate of bacteria at lower temperatures and frozen soil conditions, which the model not yet captures. "Optimising such a temporally and spatially dynamic mathematical model is a highly exciting, yet laborious task. There are so many unknowns that must be factored in," concluded Dörthe Tetzlaff. However, the scientists are optimistic that the model, and its later versions, will one day represent the scientific basis for assessing the spread of faecal bacteria in the catchments of streams.